Of course they do! Would you go onto a field to play football and not wear proper cleats or go the golf course and not wear appropriate shoes? Just like Football and Golf, having the proper equipment starts with your feet. Ballroom Dance Shoes are made with suede or leather bottoms to help with turns, pivots and utilizing the appropriate part of the foot. The shoes are also made to encourage you to keep your weight (poise) forward and over your toes. 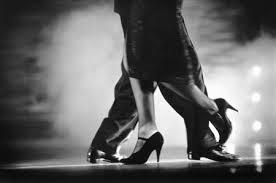 Being able to use the appropriate part of the foot and keeping a forward poise are two of the essential parts of good dance skills. When wearing flip flops or sneakers your focus is too much on how your shoes feel and not enough on having fun. The joy of Ballroom Dance Shoes not only allow for good technique but they also allow you to focus on more important things like your partner. The shoes fit to your foot, much like a glove, plus, they are way lighter and much easier to bend and manipulate! We recommend trying on a pair in person, at your local dance store or dance studio, to find your size and to see how they feel on your feet. Once you have an idea consult your teacher on good brands or types that fit your personal style! In addition to shoes It’s always nice to look the part of a dancer as well with practice skirts, latin pants, bedazzled tops and of course all the fun costume jewelry! Below are some links to some of our favorite dance shoe and equipment sites!